Mountain Mods 20 PCI Modular I/O bracket is a great part for those in need of more PCI ports than their case affords. Ideal for those looking to use riser cards for additional video cards, the 20 PCI Modular IO bracket can mount a large number of Graphics cards. The bracket incorporates Mountain Mods Air Assist. This consists of a large inset to allow for clearance of 120mm fans to be mounted between the bracket itself as well as the panel that you are mounting it to. This creates a pull of excess heat from the Graphics cards as well as between the open I/O ports not being used in between them. The bracket can mount anywhere that has the required space. 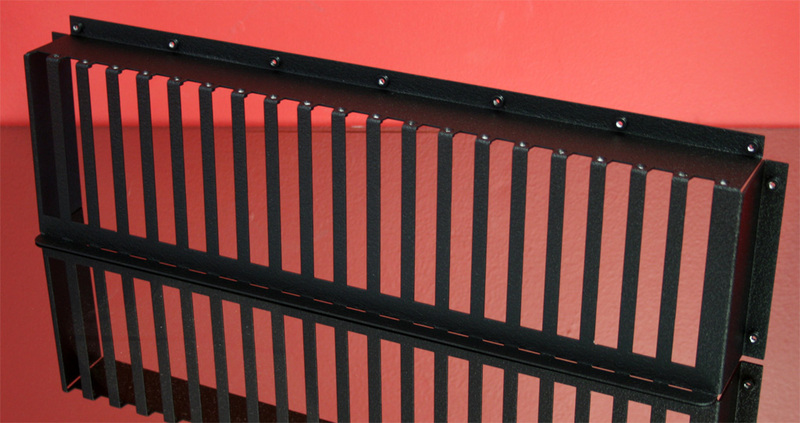 The bracket is manufactured from high grade Aluminum with a Black Wrinkle powder coat finish. An inward flange (metal bend) allows for a secure application. After mounting the bracket to your case, simply install your card/device into the modular bracket and attach with 6-32 screws at the top of the card/device. The end of the device will slide into the slotted flange at the bottom for increased security.